The first time I ever tried to grow squash on my own was the summer of 1982. My squash plants sprouted. They grew. They were beautiful. And then, boom! Over the period of one or two weeks, every one of them wilted and died. When I examined the dead plants, their roots seemed rotten. The next time I tried to grow squash was a few years later. I was careful not to overwater. The same thing happened. At the time, I had no idea why these beautiful plants would suddenly just rot at the root, keel over, and die. I gave up on trying to plant squash. When I started my garden this year, it had been a long time since I had grown a garden. 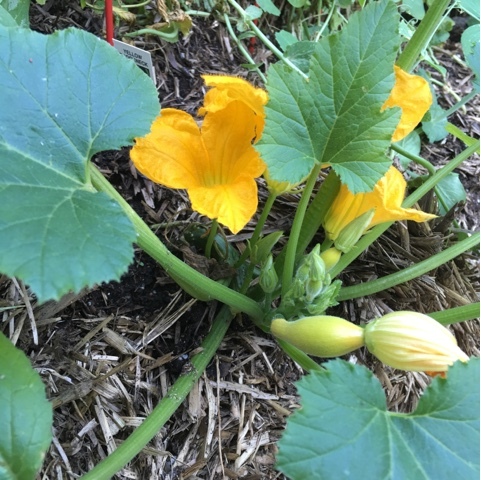 Due to the effects of faded memory, and lured by the thought of delicious, fresh squash, I forgot that I had no green thumb when it came to squash. I planted three different varieties in my garden. 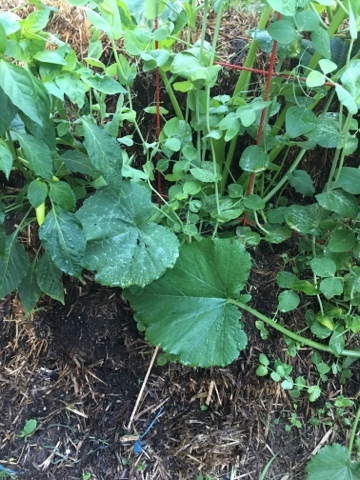 I planted a yellow crooked neck variety purchased from a garden shop, a zucchini called "green tiger," and another zucchini called "early bulam." My six yellow squash did not thrive particularly well. One or two wilted and died. I attributed it to my lack of green thumb. The rest, however, grew and began to produce little squash. To my amazement, the green tiger zucchini really took off! They turned into big, bold plants that could have been used in ornamentals in a landscape. When I planted the zucchini, I put them in the same space as English sugar snap peas. My thought was that by the time the zucchini plants were large, the peas would be done producing and it would be time to pull them out. This, in fact, did happen. At some point, the peas were dying, and also shaded out by the squash, and the squash were crowded and needed more room. I removed the peas from the bed. This disrupted the squash a little bit, but the most significant thing was that it prompted me to notice the squash closer to their roots. 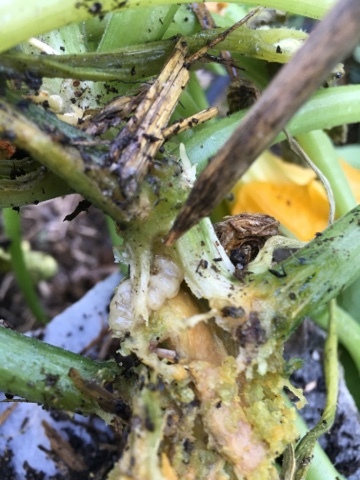 I saw the same rot beginning to afflict the tiger zucchini. No! I turned to my new friend, the Internet, to investigate squash diseases. That is when I learned about squash vine borers. When I looked closer, indeed, this is what I discovered was infesting my plants! I speculate that it was probably the cause of death of all my squash plants in my previous garden endeavors! You can read about squash vine borers on the Internet, and you can also watch YouTube videos about them. 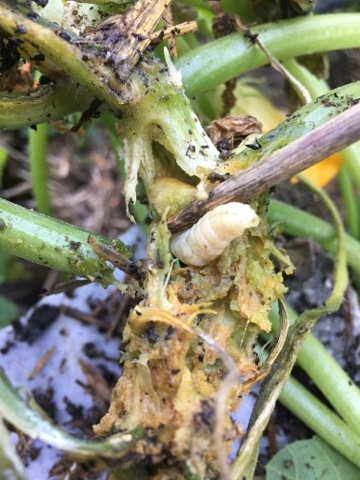 (As an example, the University of Minnesota extension service has a great web page about vine borers: http://www.extension.umn.edu/garden/insects/find/squash-vine-borers/ )My goal is not to duplicate that information here. Rather, I want to raise an alert about what vine borers are and share how I have kept my plants alive this year (so far). The adult squash vine borer is a flying insect that is brightly colored and shaped a little bit like a wasp. It lays its egg on the stalk of the plant, near the root. 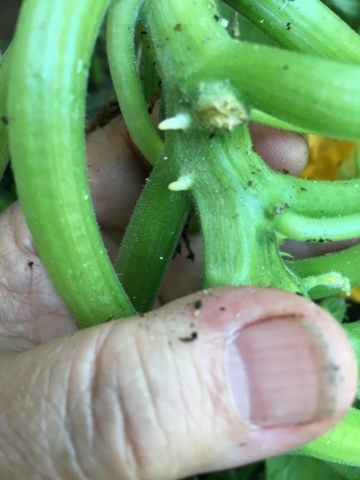 When the egg hatches, the tiny grub immediately bores into the hollow center of the squash leaf stalk. Once inside the stalk, it is not reachable by predators such as birds or pesticides. It tunnels inside the stalk, eating and growing. Eventually, it grows so large and eats so much of the stalk that the root becomes disconnected from the top of the plant (which then dies). When the vine borer grub has reached full size, it exits the plant and goes into the soil, where it pupates for a year before emerging as an adult month. The first line of defense for vine borers (and many other flying pests) is to use landscape netting over your plants that lets something light and water in but keeps insects out. This prevents the adult from laying eggs on the stalk. Internet resources say that some people also put foil and wrappings around the stalks where the insects lay eggs, to create a barrier there. Neither of these is practical for me. Pesticides that kill the insect can help, but I am trying to avoid pesticides. If prevention does not keep borers at bay, the only remedy is to find and kill the grub. A method discussed on Internet resources is to slit the stalk until the grub is located, and then kill it. Each plant may have several grubs. They must all be located and killed. Home remedies also involve burying part of the plant above the site where the grub has been removed, so that the plant can grow new roots above the spot where the old root has been destroyed. Back to the story of my garden. 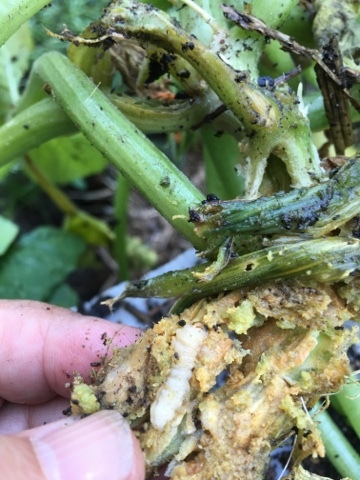 When I found the squash vine borers in my squash, it turned out that it was a big benefit to have the squash planted in well decomposed straw bales. 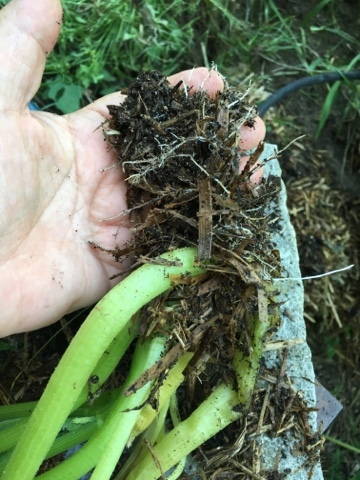 The loam they were planted in was so loose that I could use my hands to scoop out a large chunk of planting medium, pull out the entire plant (roots and all), excise the vine borer, and then replant the squash after its "surgery" to remove the borer. My observation was that healthy plant tissue was firm, whereas areas affected by the borers were mushy and rotting. Following this cue, I found it easy to use a tool to dig out the infected tissue, and to locate and destroy the borer. After experimenting with various knives and metal objects, I found that my favorite tool to use is a wooden barbecue skewer. The pointy tip can be used to scrape at and remove diseased tissue, and it also provides a fine point to use with some precision when locating and digging out the grub. The stick I am using here to show the rotten root is a long, heavy duty wooden barbecue skewer. The rot is my cue that there is a vine borer inside. I have scraped away rotten tissue and the grub is now exposed. This one is about half the maximum size, but much larger than the tiny ones that must also be caught and removed. It turns out, there were four grubs in this plant. All connection to the leaves on the top had already been destroyed. Even though the connection to the root had been destroyed, this is what the top of the plant still looked like. A grub, and the rotten area all around it. Fortunately, the root part of a squash plant will root very readily. The first time I dug a grub out of a plant, I brought the plant inside, trimmed off the rotten part of the roots, and set it in a cup to root. Within a week, the plant had nice new roots, and I was able to replant it outside in the garden. Locating and digging out the vine borers, has been my least favorite part of growing my garden this year, so far. The rotten roots are yucky, and digging the grubs out is gross. I would guess that of the plants that have been infected, I have been able to save about 75%. I have treated some without digging them up, just by using the wooden skewer to gouge and scrape into the rotten part, and finding the grub and destroying it. After I was certain that all grubs had been destroyed, I re-covered the root portions of the plant so that they would re-root. Some of the plants actually re-rooted in two places, effectively bypassing the areas damaged by the grubs. Of the plants that had more severe damage, I was only able to save a few. Here is one (shown below). A plant with root damage does not need to be focusing any energy on fruits or losing water from leaves. I removed the fruits from this plant, but when I replanted it originally, the leaves looked fine. There was so much root damage, however, that the leaves could not get water from the root, and they died. After they died, I snipped them off with sterile scissors. Notice that the plant is now putting up new leaves from the center. 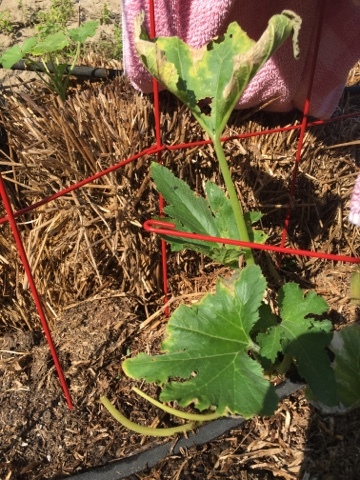 The trellis around the plant is supporting a piece of cloth that I am using to shade the plant from the sun, to reduce stress from transpiration. At present, squash plants are on sale at a local garden shop for one dollar each. It may have been easier just to pull these up and go get new ones. However, there are a couple of reasons I did not. These plants are many weeks old. It would take a new plant a long time to catch up to where these ones already are. Additionally, the tiger zucchini is not available locally, and I am out of seeds. 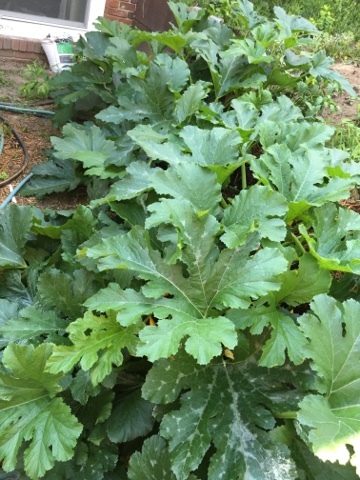 At present, these plants are producing about 10 zucchini squash per week. From what I read, vine borers have a definite time frame, and after that time frame they are no longer active and don't pose a threat in the garden. I am hoping that the measures I've taken will pull my plants through until the threat from borers has passed. 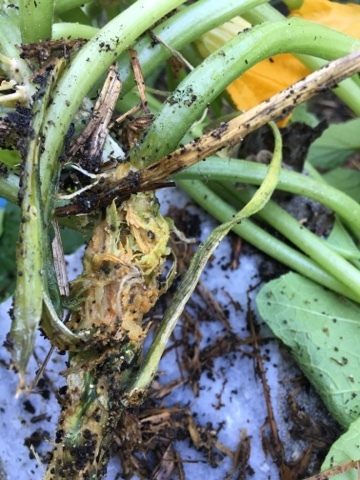 I also note that plant parts that might be infected with grubs should be removed from the garden completely and not composted. After the vine borer finishes growing inside the plant stalk, it exits into the ground and pupates for a year, before emerging as an adult. Since I have tried to salvage my plants rather then completely remove them, I probably have pupa inside my straw bills. I will not try to grow squash there next year! 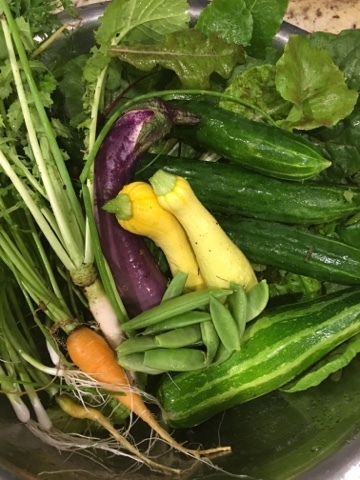 A "harvest" from my garden last week. 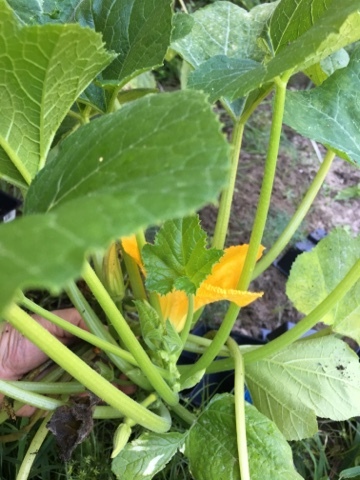 Photo shows yellow squash and the tiger zucchini.